BECOME A MASTER NATURALIST! The North Texas Chapter of the Texas Master Naturalist Program will be accepting applications beginning October 1, 2017, for its 2018 class. Master Naturalist Trainees receive in-depth education in wildlife and natural resource management, customized to focus on our local ecosystems. In return, Master Naturalists provide volunteer service in the form of community education, conservation, citizen science, and demonstration projects, while pursuing advanced training in areas of their special interests. The initial training includes 40 hours of classroom sessions plus field trips to learn about Texas’ natural resources. Training begins February 6, 2018 and continues each Tuesday from 6:00 to 9:00 pm. through May 1, 2018. Most classes will meet at Brookhaven Community College, 3939 Valley View Lane, Dallas, 75244. An Open House will be held on Tuesday, October 3, 2017, from 7:00 to 8:30 p.m. at the Texas A&M AgriLife Extension Office, 10056 Marsh Lane, Suite 101B, Dallas. Please join us to gather more information on the training and our volunteer program. Applications can be obtained at ntmn.org/about/how-to-join and will be accepted from October 1 through December 1, 2017. Class size is limited. Priority is given to applicants with a strong interest in performing volunteer service. More information about our chapter and our volunteer projects can be found at ntmn.org. The Story of BRIT: A Botanical Experiment in Herbaria and Library Collections. Mark your calendars for a special Brown Bag presentation on Tuesday, October 3 from noon -1p.m. The Botanical Research Institute of Texas (BRIT) is 30 years old but has been reinventing itself for 74 years (1944–2017). BRIT is an amazing story of how dedicated botanists acquired and developed botanical collections for teaching and research and how these collections moved from obscurity to the public spotlight. Presented by Barney Lipscomb. More at www.brit.org. 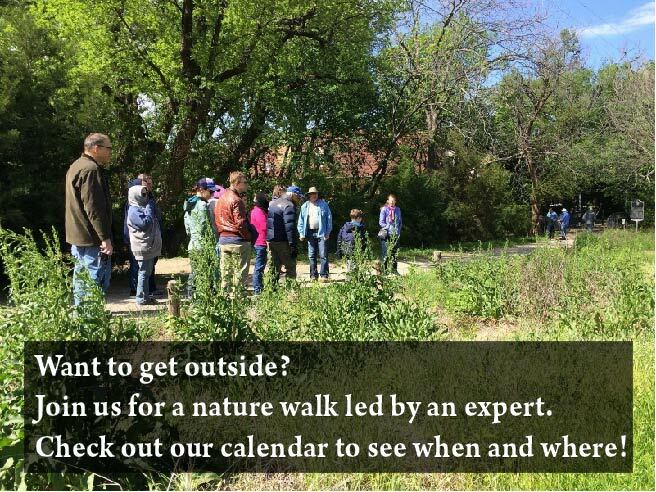 Free Bush Center Prairie Tours. The George W. Bush Presidential Center (on the SMU campus) offers fall native Texas prairie tours, 10am and 11am every Saturday through Nov. 11 (weather permitting). More at bushcenter.org. And for more prairie touring, the Native Prairie Association offers a Mathews Prairie and Clymer Meadow Field Trip, Saturday, October 14, 8:30 am – 5pm, leaving the Bath House Cultural Center, 521 E. Lawther Dr. (off Buckner & Northcliff), Dallas. Park in rows furthest from White Rock Lake. (Mandatory carpooling because parking at the prairies is limited). Please RSVP to laellis55@aol.com or text 214-395-1902. In case of bad weather, the field trip will be canceled and rescheduled at a later date. More info. at https://blacklandnpat.wordpress.com/. * Guided Trinity River Bird Count, Area 18 – Clear Fork Trinity River. Sunday, October 22, 2017, 8-10 am. Meet between 7:30-8:00 am for coffee at the Starbucks at Trinity Commons (3000 S Hulen St., #143, Fort Worth, TX 76109). We will park on Bellaire near the bridge crossing the river and walk along the paved trail ( Fort Worth Trinity Trails) along the river to just under the Chisholm Trail Parkway bridge. Team Leader: RSVP to Tom Haase at 817-229-4987 or tom.haase@sbcglobal.net and let him know whether you will meet him at Starbucks or on the trail. 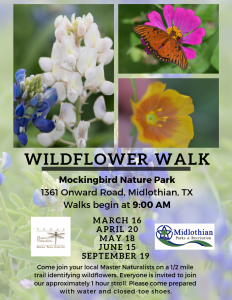 Indian Trails Master Naturalists monthly meeting hosts Pat Merkord, Executive Director, Native Prairies Assn., on “How to Use Your Land to Conserve Pollinators, Wildlife and Land & Get Tax Benefits!” Monday, Oct. 23, 7pm, First United Methodist Church, 505 W. Marvin Ave., Waxahachie, TX. For more information, please call the Texas A&M AgriLife Extension at 972-825-5175 or email: information@itmnc.com. nature_links@yahoo.comBecause nature connects us all.